Jill Greene, CVT, demonstrates how to draw blood from a dog’s jugular vein. She explains why the circumstances are appropriate for drawing from the jugular instead of a peripheral vein. 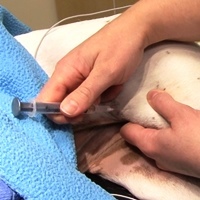 A couple of thoughts on the video: 1) Jill mentioned an alternate position for the procedure, would have been nice to see that one too, 2) Angle of the needle when being introduced is important, could have commented on that, 3) Lastly, finger dexterity of holding the syringe in one hand while drawing back can sometimes be tricky. Would have like to have seen more closely how she is doing that. We are required to use a vaccutainer in class. Would like to see that performed on a cat and a dog. I am curious about your thoughts on syringe/needle size selection when doing venipuncture. There are many factors that go into needle and syringe selection. When selecting a syringe, the first question is: how much sample do you need, and the second is: who is your patient. For example, if I need 2mLs of blood from a small elderly cat, I would probably not want to use a 3mL syringe because it may collapse the vein. I would most likely select two 1mL syringes and a butterfly so I only have to stick the cat once. When it comes to needle size, it really depends on the size of the vein you are dealing with. In the case of the small elderly cat, I will probably be dealing with a smaller vein and would opt for a 25g or 22g butterfly instead of a 20g or larger. 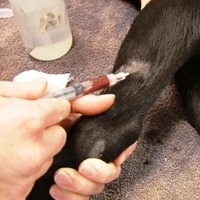 In a larger dog I would select something more appropriate for the size of vein, like a 22ga needle on a 3-5mL syringe, depending on how much sample I needed. Location of where you are drawing from also plays a factor. If you are getting your sample from a lateral saphenous vein you would choose something smaller than if you are drawing from the jugular vein. I think the take away is that every patient is going to be different and you have to use your critical thinking skills to decide what is appropriate for your patient at that time. If you have any other questions feel free to let me know, and thanks for watching our video! I had some slight issues with this video. I hate to be critical and realize a small amount of time may have been allotted to this project, but some major points were missed. Needle size, angle, position, and amount of pressure are all important factors, along with those mentioned in the video. I find some beginners think the vein is much deeper than it is, which brings a level of risk to puncture the carotid artery. Meanwhile, a quiz question mentions that head trauma would be a contraindication to jugular venipuncture, but in the video only coagulation issues was the only contraindication mentioned. 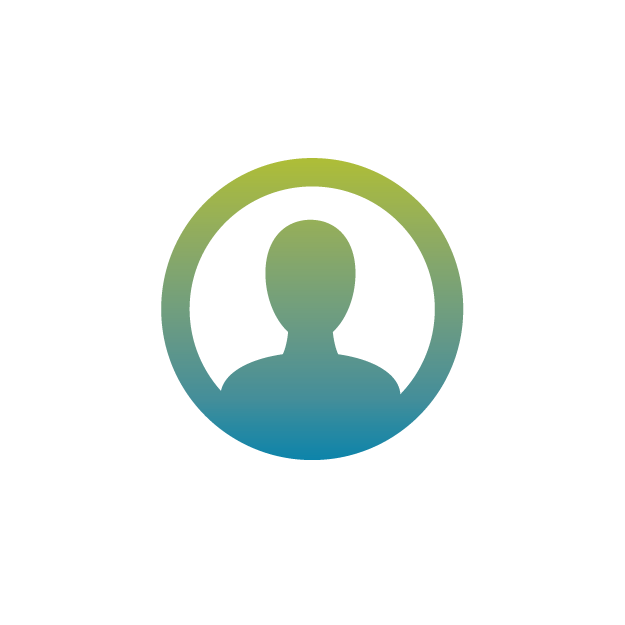 While knowing not to pursue the jugular route when head trauma is a factor, beginners may not know that. To resolve this, perhaps the video could use an addendum and the quiz questions updated with less vague or misleading answers based upon the provided information. We appreciate your feedback! Jill does briefly mention head trauma as a contraindication to jugular venipuncture at the beginning of the video. Since this is such an important consideration I think reiterating it in the quiz can be helpful for those assigned to watch this video. Also, we recently filmed a feline jugular blood draw that should be published in the next few months. This video does provide more details on angle and positioning. We will continue to consider your feedback in future procedures that are filmed! Great video very informative! I have never seen the jugular area shaved for the blood draw, mostly since clients do not want us to shave it. Do you have any recommendations of how best to do jugular draws on breeds such as bulldogs, basset hounds or other breeds with wrinkly necks? Hi Lisa, Thanks for watching! On the dogs with a lot of extra skin it can certainly make jugular veinipuncture more challenging. I have in the past had someone with a free hand hold the skin taught making viewing of the vein easier. Really, the important thing is to take your time to feel confident on the position of the jugular before poking. Palpate, use visual cues, and be familiar with normal anatomy. Yes, you can redirect your needle but starting off confident you are in the right area helps a ton. I hope you find this helpful.